Now that I am beginning to find solace from writing letters to Keith Ashley, I think I can now go back to what this blog is all about. My boy remains constant in my thoughts, but I have now found a way of communicating with him. So here is a lighter entry on this site. The day before we left for London, my sister-in-law took us to one of the most beautiful places I have seen in Zambales - The CASA San Miguel. It is located in the middle of a mango orchard in Pundaquit, San Antonio. Literally, CASA San Miguel is the Centre for Arts in Zambales. It was established some time ago by Sir Coke Bolipata, an acclaimed violinist and was in a Cinemalaya film - Boses. The CASA- This is where Keith Ashley first learned how to play the violin and where he went for his art classes every Sunday. They also do recitals and exhibitions there. The Concert Hall where recitals, theatre plays, concerts etc are being held. Apparently, according to Ate Lucy this was painted by Keith Ashley's Art Teacher Zaniel and could be found at the stairs landing above the Cafe. This building was under refurbishment when we visited, in preparation for an upcoming Art Exhibit in the summer. In the building above, we found this artwork by one of the renowned artists in the Philippines- Mr. Elmer Borlongan. His (most) famous painting is "Batang Edsa". We had the privilege of meeting the man himself- Mr. Elmer Borlongan (left) and Teacher Zaniel (right). Mr. Borlongan and his artist wife, Ma'am Plet currently live there. This house kind of reminds me of Yves Saint Laurent's house in Marrakech, Morocco- The Jardin Majorelle. We would have loved to see the interior of the house, unfortunately we were (I was anyway) embarrassed to ask. Maybe next time. 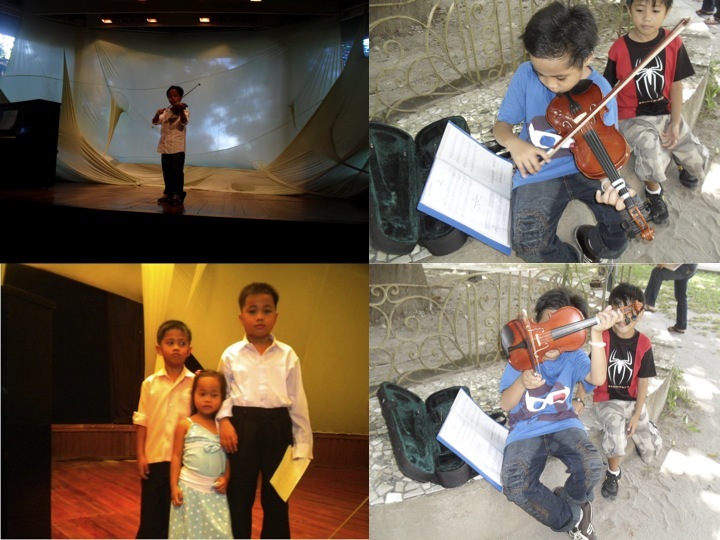 We also met some of Keith Ashley's violin teachers and other students- one of them Promil's Gifted Child and former child actor Julian Duque, a very talented boy. He was in the film Boses with Sir Coke. This wall caught my attention, only because I knew that Keith would probably loved to paint it as he loved bright colours, although I don't think he has used the colour red so much in his paintings. This blog only proves that I can never be a travel blogger. I mean, that is all I can say about this beautiful place? I wish I was more descriptive and creative in my writing. But hopefully the photos will speak for it. I am not sure how long will I be writing about my struggle to find solace after the death of our beloved Keith. Some of you may eventually get tired of reading my (depressing) blogs, but this is my one way of trying to cope from the loss of my beloved child. I can only hope that you understand. But perhaps you really won't, unless you are or have been in our shoes. It's now more than three weeks since Keith left us forever, and the wound is still as fresh as when I received the phone call that changed my life forever. At some point I thought I may have accepted that Keith really didn't belong to us. But could I be just in denial? Every single day, I keep asking why. Sometimes I even hear myself asking out loud. At times I want to scream, punch the wall or break something. I know I am angry. But angry at what, with whom? I don't know. All I know is that I am still very much grieving and the pain remains so strong. Possibly, I am also bitter that other kids with Dengue have survived and Keith didn't. It also breaks my heart to read my sister-in-law's status updates on facebook. She has been using the networking site to express her feelings, probably hoping that someone out there will leave her with kind words to comfort her. From what she has been writing, it is very obvious that she's struggling to come to terms with Keith Ashley's passing, much more than I do. I want to help her, but I know I need to help myself first. Our planned trip to New York on Friday would have been a good start of my journey to recovery. However, we were not able to go. Thanks to ESTA (Electronic System for Travel Authorization). I didn't realize that I needed an authorization to travel- a requirement that was implemented by the US Embassy three years ago. Apparently even British citizens now need an ESTA before they can travel to the US. I was really disappointed, but yet again, things happen for a reason. So instead we spent the weekend with a relative in Oxfordshire, which somehow gave me comfort. But comforting as it was, I still felt the need to search for other grieving mothers on the world wide web. Because I know that we are not the only mothers in the world who have lost a child. Somehow I believe that I will find solace from people who have suffered the same loss. I found a few websites which are quite helpful. I found a couple from the Philippines too, which I am hoping could somehow help my sister-in-law, and even my mother. I would not normally do such thing, but I thought I'd reach out to these people. I sent an email to Mom Blogger as well as to INA Foundation, but I am not sure if they will reply. But simply knowing that there are mothers out there who have been willing to share their experiences of losing a child kind of comforts me. I know this is going to be a very long journey for all of us. This tragedy has even left me with panic attacks. I worry about my family constantly. But I know God is guiding us and Keith is looking over us. It also comforts me to know that Keith was the child that we can forever be proud of. He will always be remembered by people as the "batang mabait" (good boy), talented, intelligent and good-looking. We will always love you baby. Letting Go and Moving On...through "Lighters"
Coming back to England has never been harder. On Tuesday morning as I entered our flat, there was a deafening silence. The room was obviously as we left it when we found out that our baby Keith has left us forever. Don took a picture of the room while I tried to do normal stuff. Somehow Keith kept popping into my head. I was missing him terribly. At the same time, I was thinking about my family. How I wish I could have stayed until we all have moved on. The next thing I knew, Don and I were both crying, hugging each other so tight. Then questions came rushing through my head. Why Keith? Keith was such a good boy. He won't hurt a fly. He looked after everything that God created, even what probabaly killed him. 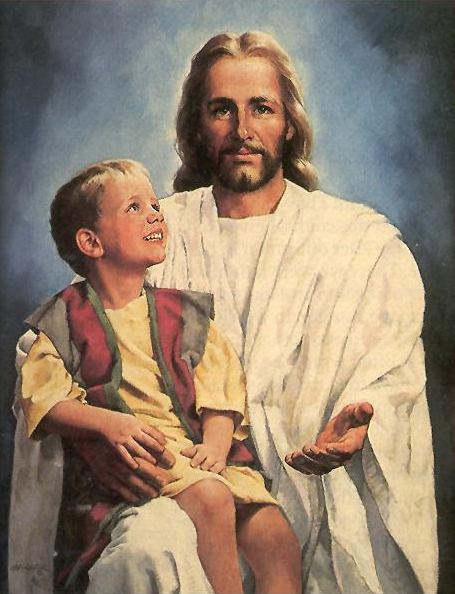 He was God's servant. He read the Bible and prayed more often than most adults I know. He collected prayer books and rosaries as souvenirs when visiting places. He never said a bad word. He respected everyone. Why did our family has to go through the pain and sorrow of losing our beloved Keith? I know we are not perfect and we have our own shortcomings, but as far I know we never have wronged anyone. And even if we did, why did Keith has to pay for it? I'm sure there are a lot more people worse than us. Our family will not do anything in expense of anybody. God knows how much we love and care for our kids. Some people are not even capable of doing that. So, why us? No one can't even question our faith. I may not often pray to God, but I certainly have faith in Him. My mother has a strong faith in God, so does my sister-in-law and the kids. There are a lot of people out there who don't even believe in God at all. Why are they being spared from all this? Yes, just like what everyone has said, God has a purpose. But when are we going to find out about this purpose? I have been trying to look at the brighter side, but it has been really difficult. I know Keith is now our Angel as he was when he was with us. But the pain remains so strong. All I want to do now is to let go and move on. But how? I know Keith doesn't like seeing us sad. I know he would rather see us happy. Keith when he was with us didn't like sadness, nor conflict. All he wanted was happiness, peace and harmony. I know it's hard, but one day we will surely understand God's purpose. For now, it comforts me to know that we have an Angel up there looking over us. And I pray to God that whatever His reason is for taking Keith away from us, that it is for the good of those he has left behind. I just like to imagine that at the moment, he is playing violin with Mozart in heaven, in front of other angels and God. And also, one day soon (if he hasn't yet) he will finally meet Monet so they can paint together. 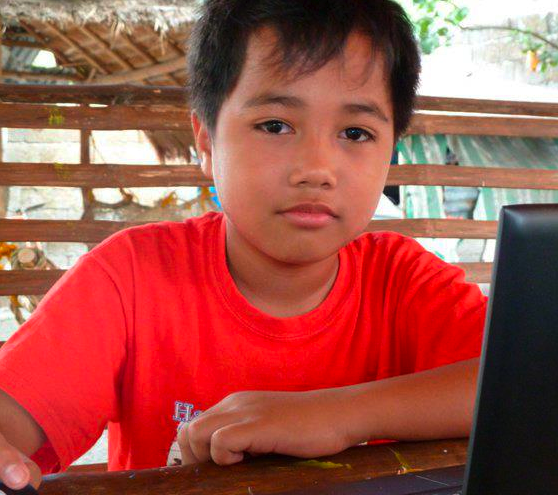 As what ading Cxyrelle told me, he is now playing computer with the angels, researching for diseases and animals and watching music videos on you tube perhaps- things that Keith loved doing. I think that's all I needed to say in order to start moving on. They may not be the right words to say, but it all came from the heart of a mother who has just lost a precious child. A sky full of lighters"
For those who knew and loved Keith, may the bright stars in the sky remind you of the "Lighters" that was Keith Ashley. We love you so much, Keith! You're constantly in our thoughts. No wound is ever more painful than losing a child. And as they say, no mother should bury their own child. Unfortunately for me, that is the reality. On January 28, my son passed away unexpectedly. He was 11. I never thought that he would be taken away from us too early. He was a healthy child, full of life and potential. It all started with mumps. He recovered from that, but a few days after, he developed an on and off fever. His mama brought him to different specialists and they all thought that it was an infection, but couldn't point out where the infection was. Then he had test for Dengue, but the results all came back negative. Apart from his fever, his only other complaint was a headache, which to him was bearable. According to my mother and his mama, he didn't show them that he was in any pain. He would even say, "wala po ito, headache lang" (this is nothing, just a headache). On Wednesday the 25t of January, my sister-in-law asked if I could call. I was at work, but somehow I felt that I needed to call. So she told me that my son's fever was persistent despite round the clock Paracetamol and the 3 days worth of antibiotics (and 7 different physicians). I instructed them to take him to the hospital against his will. Once admitted, he had convulsions. He again was tested for Dengue three times- the first two were negative, the third one was "slightly" positive. Dengue never came to my mind. I was more worried that he might have had meningitis. But apart from headache and fever, he had no other classic signs of meningitis. He apparently had a chest xray and the doctors thought he had pneumonia. Then his platelets started to drop. Haemoptysis followed, then he started passing blood in his stool. Despite platelets and blood transfusions, the doctors were not able to save my baby. The cause of his death was Dengue Haemorrhagic Fever. Honestly, I really don't want to know what exactly happened. It hurts so much as it is. But according to his mama, he never showed any signs of suffering. His Tito JL and Tito Junjun, who were with him until the end, even said that up to his last breath, he was smiling. One week on, the wound is still very fresh. Although I know that God has a purpose, I still can't help but ask, "why Keith?". He was such a wonderful boy. He was extraordinary. Perhaps he really was not meant for us. I remember my Inang telling me that when Keith was still a baby, an old woman told her that looking at Keith's eyes, he really wouldn't last long. Because "malamlam" daw ang mga mata niya (he has ?gloomy eyes). Others said that he really looked like an angel, that's why he didn't belong to us, but to the Lord. Whatever the reason is, I hope we'll find out soon. Keith Ashley left us with good memories that we will treasure forever. Keith Ashley was a very shy boy. He wouldn't speak, unless you speak to him. He was an inspiration to a lot of young kids- because of how "bait" he was and how talented he was. He was indeed an "Angel" in so many ways. Keith was a child any parent would wish to have. Napakabait. He always spoke with respect. He was never a headache to anyone. Even strangers would say he was a good boy. I will never ran out of good things to say about Keith. Let me leave the rest to other people who know him too. He also had a passion for Art. He started painting when he was 9. 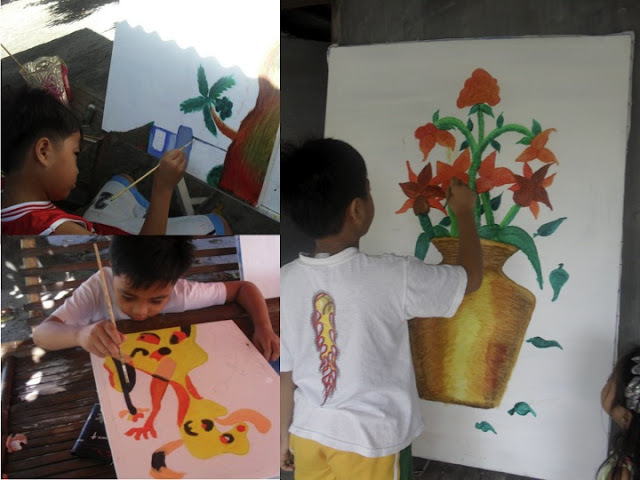 But he showed talent in drawing at an early age of 2 when he started school. Trains were his favourite to draw. His inspiration was Claude Monet. Click here to see more of Keith Ashley's paintings. Despite of his busy schedule, Keith Ashley never failed to read the Bible every night. He also often read the Dictionary and the Science Encyclopedia. He was an officer at his school's Student Council. He was also a Knight of the Altar and a Choir Member. 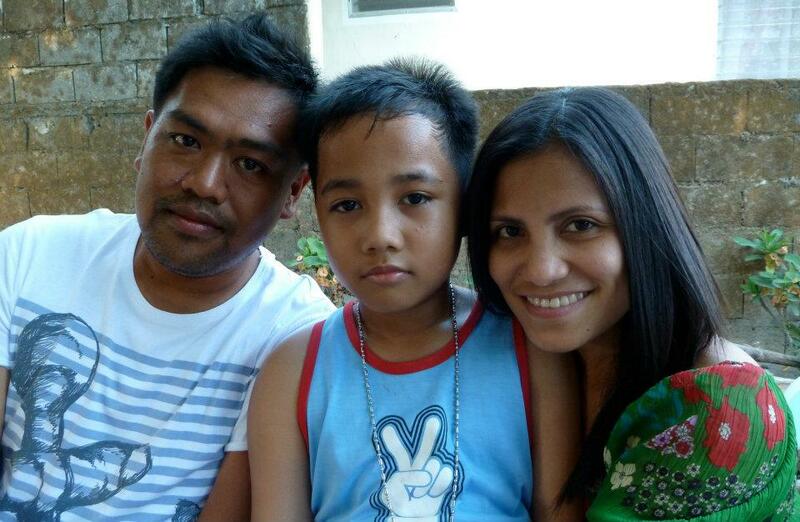 He represented his school and his hometown at last year's Mathematics Trainers' Guild in Naga City. No words can really express how devastated I am right now. I know things will get better, but the fact that I will no longer be able to kiss and hug my baby hurts so much. At only 11, Keith has lived his life to the fullest. He was loved not only by his family and friends, but by a lot of other people. As his mommy, I never failed to make him feel that he was loved and cared for. I always told him I loved him. What happened to Keith only proves that life is indeed so short. We should not forget to remind our family and friends, especially our parents and our children that we love them. No matter how hard life is sometimes, if we love each other, life seems easier. To our dear Keith, we will love you forever and you will always be remembered. One day I will do something for you so people won't forget you. I love you very much anak ko!